The ghostly image of the man with the beard. (5/13) Just a few days ago I went to visit the fake Shroud of Turin. Now before I get a bunch of emails about how the Shroud of Turin is definably real and that any tests that have been performed showing anything else have been flawed, I will state that what I saw was definitely the fake Shroud of Turin because I saw it in Bristol, Pennsylvania, not in that famous chapel in the town of Turin, Italy. 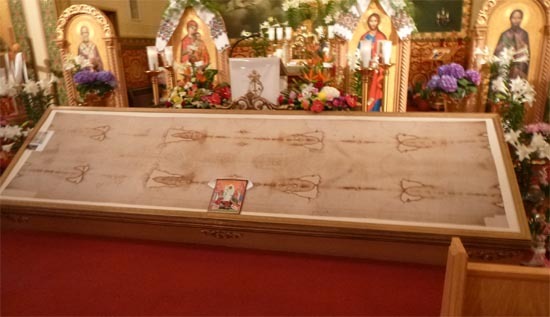 The object I saw was an acknowledged replica of the Shroud owned by the Ukrainian Archeparchy of Philadelphia. It gets moved around from location to location so people in the local area here can see it. This really makes quite a bit of sense. The real Shroud is a delicate artifact that is hundreds, if not thousands, of years old. It never travels and is only exhibited every couple of decades or so. The closest most people are going to get to it is through viewing a replica or seeing pictures. Given this I decided that since my chances of observing this famous artifact in person in this lifetime were slim, the best I could do was probably to see the fake - I mean the replica version - owned by the Archeparchy. You could argue that I could have just as well gotten a view of it by looking at photos of the original in books, or on the internet, but I think there is a real value at seeing a well-made replica. You get a sense of scale and the thing seems more real, even if it isn't. The pseudo-shroud was the same size as the real one - a little over fourteen feet long and almost four feet wide. It was displayed in a large wooden frame behind glass. One advantage of the replica over the original one was that I had as much time as I wanted to examine it and I could get as close as I desired. This would probably not be the case if I had to squeeze in with the crowd during one of the rare times it was on display in Turin. The object before me showed the image of a bearded, naked man as if the cloth had been folded over him from foot to head and back down to the feet on the other side. The man's hands were crossed over his crotch and the one visible wrist showed signs of an injury that was probably consistent with a nail wound. The hands appear to be crossed with a wound on the right wrist. The Shroud (the one in Turin, not the one in Bristol), for those of you not familiar with its story, is probably the most intensely-studied religious artifact in history. However, not much is known about it before 1390 A.D.. In that year Bishop Pierre d'Arcis wrote a memorandum indicating that he believed an artifact purporting to be the burial cloth of Jesus being shown in Lirey, France, was a forgery. The bishop would not be the last person to question the cloth's authenticity and the debate over whether it was real or not has raged ever since. Despite the bishop's doubts, the Shroud was still considered sacred and was often displayed and visited by the faithful. In 1532, it was damaged during a fire at a chapel in Chamb�ry where it was stored when a drop of molten silver burned a corner of it. The Shroud was folded at that time and this left burns at several different locations on the cloth. In the 17th century the artifact moved to Turin and installed in its own chapel, built just for it, where it has been kept ever since. Its history before 1390 A.D. is the real mystery. According to the biblical account of the resurrection, visitors to the tomb on Easter morning found it empty of a body, but they saw "the strips of linen lying there, as well as the cloth that had been wrapped around Jesus' head. The cloth was still lying in its place, separate from the linen." From this it is clear that some part of the wrappings were left behind, though it mentions a separate cloth for the head, not a whole body wrap. In fact, in 1543 John Calvin used this report of a separate head cloth to support his skepticism of the Shroud. Others have suggested, though, that the head wrapping might have been used earlier (perhaps in transporting the body to the tomb) and left there, but not used in the final wrapping. There is another artifact called the Sudarium of Oviedo, which is preserved in the Cathedral of San Salvador in Oviedo, Spain, which is supposed to be the cloth that was used to cover the head. There are some good reasons to be skeptical about either of these objects. During the Middle Ages there was quite a demand for religious Christian artifacts and as a result the creation and sale of fakes was rampant. The sixteenth century Catholic theologian, Erasmus, noted that if you brought together all the wood that was claimed to come from Christ's cross, there would have been enough to construct several buildings. Similarly, only three or four nails would have been used to crucify Jesus, yet there were at least thirty nails being venerated as relics across Europe in medieval times. If one could establish the age of an object, it might be an indication of its authenticity. If the Shroud isn't the linen mentioned in the biblical account but was the work of a forger, it might have been created as late as the 14th century. If it is the burial cloth of the founder of Christianity then it must be much older and been made no later than the beginning of the 1st century. There are rumors about the existence of such a cloth previous to 1390, but no reliable records, which means the question of its authenticity is really left up to science. The negative made by Secondo Pia in 1898. The first test of any type that was done on the artifact was the simple act of photographing it which was first done in 1898 by Secondo Pia. Pia was startled to notice while he was developing his prints that the image of a man on the cloth was much clearer when viewing the negative of it than when you actually looked at the cloth itself. This perhaps suggested the shroud itself was a kind of negative. Over the years many tests have been conducted on the Shroud, though most of them have been non-invasive in an attempt to preserve this valuable artifact from damage. Probably the most controversial was a carbon dating test done in 1982 by STURP (Shroud of Turin Research Project). By detecting the level of carbon-14 left in an organic object you can get an idea how long ago it died. Since the cloth was woven of living material, by using a tiny sample of it you should be able to tell how old it is. In the test conducted in 1988 tiny pieces of material were sent to several laboratories who all pegged the age to within a few decades of 1350AD. As this was over a thousand years after the death of Jesus, this would seem to clearly indicate that the cloth a fake, or at best an art object that had been misinterpreted. However, almost immediately there were complaints that the section of the cloth used for testing was actually not part of the original shroud, but a later repair and did not represent the cloth as a whole. Others claimed that contaminants from either the fire or handling by human hands might have also altered the dates given by the carbon dating test. Further confusing the issue are recent claims by Giulio Fanti, a professor of mechanical and thermal measurement at Padua University, that he analyzed the samples by a different method of radiocarbon dating and found the cloth to date between 300 BC and 400AD, just the right age for it to be authentic. There have also been several other intriguing investigations done on the cloth that seem to lean toward it being real. Initially scholars thought that the complex herringbone twill of the Shroud was beyond the capability of weavers in the Middle-East in the 1st Century A.D. However, a sample of cloth found at the ancient fortress of Masada from about the same period is similar to the Shroud and suggests that this wasn't the case. A full length photo of the shroud by Secondo Pia. An analysis of dirt particles from the Shroud's surface seem to suggest they came from the travertine aragonite limestone found in tombs in the area of Jerusalem. Also, the impression of a flower on the cloth - Chrysanthemum coronarium - first noticed in 1985, is consistent with the image being created in the spring (which is when Jesus was executed). There have also been claims that the different types of pollen found on the Shroud are mostly from the area of Jerusalem or the eastern Middle East. Some scientists believe they have identified blood stains on the Shroud. In 1980 Alan Adler and Dr. John Heller found what they believed were blood flecks picked up off the cloth when sticky tape was pressed against it. One scientist even identified the blood as type AB and found some fragmented DNA. However, skeptics point out that the amount of material analyzed was so small that it might have come from somebody who simply handled the cloth at some later time. One of the more interesting findings about the Shroud is that the picture on it seems to be three dimensional. In 1976 three scientists, Pete Schumacher, John Jackson and Eric Jumper, used a device called the VP8 Image Analyzer to examine a photo of the Shroud. The Analyzer, built for NASA, was designed to create a 3D image from a flat picture by using the dark and light areas to represent height. The original purpose of this device was to create 3D images of the moon from regular photographs. 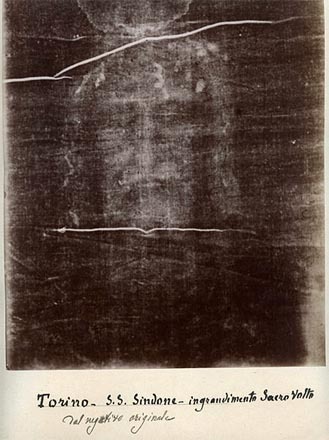 When the machine used to scan pictures of the Shroud, however, the image took on the shape of a man. 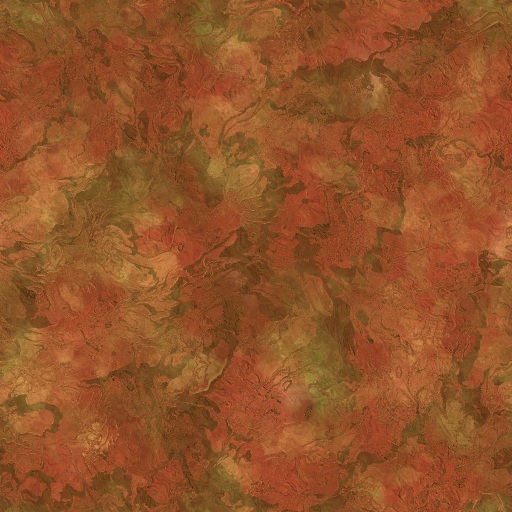 Though we know the image is in 3D, we still haven't got much of a clue about how it is actually formed on the cloth. A number of people have tried to reproduce the image using techniques from painting to a form of medieval photography. While some of them are successful in producing something that looks like the Shroud, there are experts that argue that they do not reproduce the image correctly all the way down to the microscopic level. 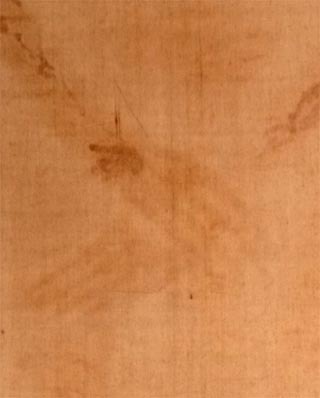 Probably one of the techniques that got closest to what we see on the Shroud (and by my thinking was probably the method used by the forger, if indeed the Shroud it a forgery) was done by Jacques di Costanzo, of Marseille University Hospital, in 2005. He had a bas-relief ( a type of sculpture that stands out from the background ) created that looked like the figure on the Shroud, then draped it with wet linen. He then let it dry so it molded itself to the statue and then dabbed ferric oxide, mixed with gelatine, onto the cloth. When the cloth was allowed to dry, then pulled off and reversed, the image resembled that of the Shroud. Most importantly the result had no brush strokes. 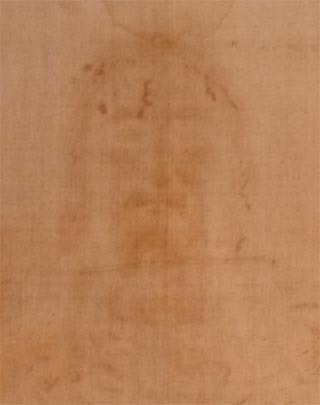 The lack of brush strokes on the Shroud of Turin is often cited as an argument for it not being painted by an artist. So, is the Shroud of Turin real or fake? Just looking at the replica it struck me how much the image on it seemed to be exactly what we might expect to see down to the blood dripping out of a nail wound on the hand. I've observed that things in the real world are rarely that neat and tidy. It reminds me of a minister friend of mine that remarks that he doesn't like pictures of Jesus that make him look too "clean" and unreal. To me, the Shroud looks too perfect to be authentic. At a certain level, does it really matter if the Shroud is genuine? Even if you can prove that the Shroud was actually used to wrap a victim of crucifixion in Jerusalem in the 1st century A.D., will you ever be able to prove that the person involved was Jesus of Nazareth? The Romans were not shy about nailing people to the cross and it could be one of hundreds of victims. And even if you prove that it was Jesus, existence of the Shroud really doesn't prove or disprove the central tenant of Christianity, which is that Christ rose from the dead. Proponents and skeptics seem to fixate on the Shroud as evidence one way or the other of the Resurrection, but it really isn't. And I think the Catholic Church, which has owned the Shroud since it was gifted to them in 1983, understands this. They take no position on the authenticity of the artifact, leaving it up to the individual to decide on their own what they think. Perhaps we should appreciate the cloth for what we know it to be: a mysterious work of art. Perhaps produced by some unknown force of nature, a cunning forger, or maybe just a clever artist. The replica on display in Bristol, Pennsylvania.